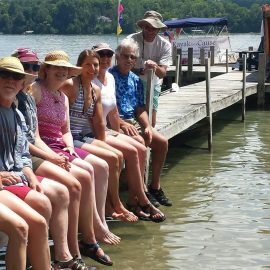 Kayak for a Cause on Walloon Lake is made possible by the efforts of many volunteers. Among those are Mark and Laurie McMurray who provide the Saturday night spread for the kayakers at the end of the day. On Sunday, there will be food and refreshments for the “We Did it Party” at the end of the paddle sponsored by the Board of Trustees of Camp Daggett. In addition there are the members of the team that help pull the entire event together. They include: Laurie Ford, Mary Ling, Laurie McMurray and of course Karen Marietti. Saturday, July 20 8:30 a.m. – 4:00 p.m. | Sunday, July 21 9:30 a.m. – 1:30 p.m. The cost to participate in this event is a minimum of $50.00. Golf cart sponsors in addition to sponsoring the cart in the golf benefit, June 6th, are sponsoring a kayaker. Kayakers may get support from family, friends, and co-workers to raise dollars to support the Camp Daggett Adventure Center (CDAC). Kayakers can dedicate their pledge/fees to a specific school district or school of their choice. Pledging to a kayaker can easily be done online. For those who wish to pledge online, select the dollar amount, and then locate the name of the team member. Select Add to Cart and then follow Pay Pal instructions. If you prefer, you may call Camp Daggett with a credit card by calling 231-347-9742 or checks can be written to Camp Daggett and mailed to 03001 Church Road, Petoskey, MI 49770. 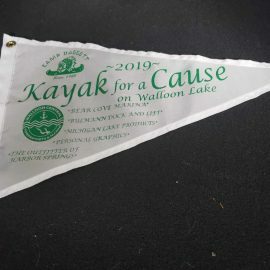 Order your custom designed 2019 Kayak for a Cause on Walloon Lake flag for $50.00 and receive the schedule of when and where the team will be on the lake during the two-day paddle. As the team passes by your lakefront home, you and your family can kayak with the team or simply cheer the team on from your dock or boat. Select “Purchase Flag” button and the option amount then select Add to Cart and follow Pay Pal instructions. If you prefer, you may call Camp Daggett with a credit card by calling 231-347-9742. Checks can be written to Camp Daggett and mailed to 03001 Church Rd., Petoskey, MI 49770. Please note “flag” on your check and include the address where you would like the flag to be delivered. Order your flag now! They are becoming a collector’s item. Each flag costs $50.00; two flags would be $100.00. Thank you for purchasing a flag. If you would like to make an additional donation to Camp Daggett, please see below. Delivery of flags is guaranteed prior to the event. If the address where you want the flag delivered is different than what is provided with the charge information, please contact Grace Ketchum at Camp Daggett (231-347-9742 x 118) with the address where you want it delivered. Would you like to simply make a donation to the Camp Daggett Adventure Center program? Please select the option amount and hit “Add to Cart” and follow Pay Pal instructions. If you prefer, checks can be written to Camp Daggett and mailed to 03001 Church Rd., Petoskey, MI 49770 or you may call Camp Daggett with a credit card by calling 231-347-9742. If writing a check, please put CDAC Programs on the check. Donations will gladly be accepted prior to and after the event. 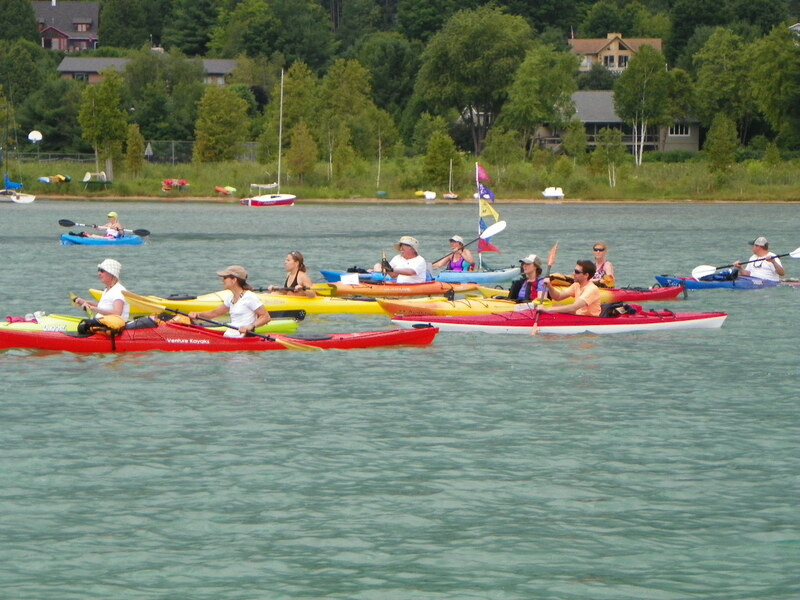 There is no other kayaking event like this in Northern Michigan, and it is catching on like wildfire. In 2009, Karen Marietti, Director of the Camp Daggett Adventure Center, made her way around the lake alone; the following year 9 kayakers joined her; and in 2010, her team grew to 18 kayakers. It has continued to grow each year. Select the level of sponsorship you would like, then hit Add to Cart and follow Pay Pal instructions. If you prefer, checks can be written to the Camp Daggett Adventure Center and mailed to 03001 Church Rd., Petoskey, MI 49770 or you may call Camp Daggett with a credit card by calling 231-347-9742.